I HAVE OWNED 3 OF THESE IN MY YEARS OF COLLECTING AS I WAS HOOKED THE FIRST TIME I EVER SAW ONE. 2 WERE THE ALL TO TYPICAL VERY WEAK EMBOSSED ONES. THE THIRD WAS A REAL NICE STRIKE BUT VERY DARK AMBER AND WAS TRADED OFF....THIS ONE IS STAYING, GREAT STRIKE & COLOR THAT PASSES LIGHT FOR DISPLAY OF ONE OF THE MOST RECOGNIZED TRADE MARKS IN BOTTLE COLLECTING. Since its annexation into the United States in 1845, Texas has provided a home to its share of medical quacks who made their living off of the desperate and the scientifically illiterate. Of the many Texan nostrum peddlers throughout history, however, William Radam probably perpetrated the biggest medicinal hoax of all with his celebrated Microbe Killer. This elixir was even more successful because it made its debut just as the link between microbes and disease was first being documented – but, as science would eventually demonstrate, the Microbe Killer was absolutely worthless. William Radam was a native of Prussia, and once served in the Prussian army; however, his first love was gardening. Radam eventually moved to Austin, Texas, and established a gardening store and nursery, tending to his 30 acres of land for nearly two decades. Then he was taken ill with malaria, and sought out doctors who prescribed various drugs for him; in his 1890 book Microbes and the Microbe Killer, Radam stated: "I swallowed the contents of bottle after bottle, until their number became too great for calculation. I took quinine until it failed to have any effect." Rheumatism and sciatica made Radam's life even more difficult, and then two of his own children died. At that point, the broken-hearted and ailing Radam, no longer strong enough to attend to his affairs, began his own quest to cure himself. Perusing through medical journals, Radam found no remedies within their pages, but he did discover microbes. For the first time in history, physicians and scientists such as Pasteur and Koch were able to prove a definitive link between certain microbes and disease, and Radam was convinced that all of his illnesses, including his rheumatism and sciatica, were caused by multitudes of microbes that had invaded his body. Hearkening back to his gardening background, Radam got the idea that killing microbes in the human body was similar to killing bugs that attacked plants. "Disease is fermentation," Radam later wrote, "and fermentation without microbes is impossible. Therefore disease must be accompanied by microbes." Using his gardening books and his microscope to try and find a cure for human ailments, Radam finally produced a liquid that he considered a universal and non-poisonous antiseptic, and Radam dubbed this new discovery the Microbe Killer. "The microbe killer," Radam later wrote, "cannot be compared with ordinary drugs. It does not contain any of them. It is pure water, permeated with gases which are essential to the nourishment of the system, and in which micro-organisms cannot live and propagate, or fermentation exist." The new concoction could be imbibed in almost the same way that water could, enabling the patient to continue using the Microbe Killer until "the tissues shall be thoroughly soaked with it, and the blood becomes perfectly purified." Radam began drinking the liquid for six months, after which he claimed a full cure of all of his ailments after the last noxious microbe in his body bit the dust. Radam was convinced that his discovery could cure anyone, but also wary that he could face manslaughter charges if he gave the Microbe Killer to someone who eventually died from the doctor-prescribed medications he took along with Radam's elixir. Thus, he discreetly gave away a couple of jugs filled with Microbe Killer to a few ailing patrons, who claimed a full recovery from their ailments soon afterwards. People began traveling to Austin, begging the gardener for the Microbe Killer; soon Radam was so busy making Microbe Killer that his garden was overrun with weeds, and Radam decided to make his new discovery his full-time occupation. Radam patented the Microbe Killer on September 28, 1886, but stressed that the liquid's ability to "kill all fungus, germs, parasites, and other matter producing fermentation or decay" was meant for preserving food, not for treating disease. After reportedly showing off the Microbe Killer in Dallas at the State Fair of Texas, Radam began selling his new elixir by the jug. The first Microbe Killer jugs appear to have been salt-glaze jugs manufactured by Meyer Pottery in Atascosa, just south of San Antonio. 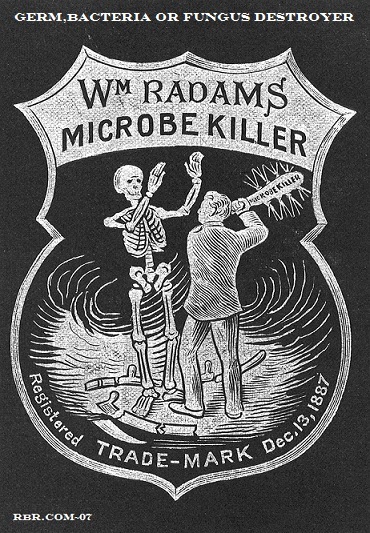 Radam's first printed advertisement for the Microbe Killer may have been in the August 30, 1887, issue of the Austin Statesman; he secured the trademark for Microbe Killer on December 13 that same year. And what a trademark! It featured a healthy young man, clothed in a business suit, swinging a club at a fearful skeleton whose scythe already lay at its feet, smashed to pieces. If Radam was ambivalent at that time about claims that the Microbe Killer could cure disease, the trademark seemed to drive the message home: the Microbe Killer could conquer death. How would the medical profession respond to the German gardener's panacea? Radam warned that physicians "have known how to blindfold the people and keep them in ignorance of the first principles of Nature's laws and operations, just as the Salvation Army misleads the ignorant and rules its devotees with the terrors of an alleged Satan." The surgeon's tools "are the means of destroying more lives in our hospitals and colleges than are the weapons of all our desperadoes and lawbreakers." Champions of natural science like Pasteur unlocked the secrets of microbes, but they were so intent on theories instead of facts that their shortsighted observations allowed a humble gardener to step forth with a sure cure for all of mankind's afflictions. Even nostrums that claimed to purify blood were just as dangerous as doctors; Radam observed that "The public likes to be humbugged." Better to simply try the Microbe Killer and start destroying the microbes that plagued oneself rather than waste one's time with anything else. Enough Americans were so willing to try the Microbe Killer that in 1888, Radam used some of his new fortune to build the Koppel Building on the site where his old nursery once stood. 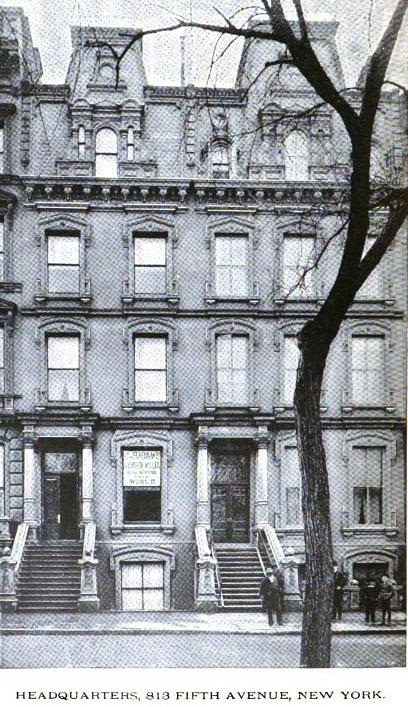 By 1890, Radam had taken leave of Austin for New York City, setting up his laboratory and main office at No. 7 Laight Street while settling into a mansion on Fifth Avenue with a great view of Central Park. The one-time gardener now operated seventeen factories across America that produced bottles and jugs of the Microbe Killer in three different strengths, many of them now boldly bearing the phrase "CURES ALL DISEASES" underneath the trademark. Radam's shop on Broadway offered a free glass of the Microbe Killer to anybody who walked in. Potential customers could also see pictures of the dreaded microbes in Radam's new book, the distinctive Microbe Killer logo stamped in gold on the front cover of each copy. And then the first serious challenge to the Microbe Killer presented itself. R.G. Eccles, a physician and pharmacist from Long Island College Hospital, published a report detailing his own analysis of the Microbe Killer. Eccles reported that the Microbe Killer was merely water mixed with miniscule amounts of hydrochloric acid and sulfuric acid. Radam immediately went on the warpath while defending his Microbe Killer at the same time. The 1886 patent revealed that Radam manufactured Microbe Killer by mixing powdered sulfur, sodium nitrate, manganese oxide, sandalwood, and potassium chloride and burning the mixture in an oven; the vapors mixed with vapor from water located in a closed tank in which the oven sat. After the treated water was allowed to condense and then filtered to remove any sediment, a tiny amount of wine was added to give the Microbe Killer a light pink tint. Radam swore, "I have never bought nor used one dollar's worth of sulphuric or muriatic acid to make my Microbe Killer." He conferred with his attorneys to launch a libel suit against Eccles. Eccles was not deterred. He called Radam a "misguided crank" who was intent on "out-quacking the worst quacks of this or any other age" while realizing profits of 6,000% from his worthless cure-all. (One analysis of the Microbe Killer by the Department of Agriculture placed the water content of Microbe Killer at 99.381%.) Furthermore, Eccles started laying the groundwork for his own suit against Radam because the latter had called Eccles a charlatan. Eccles' suit was the first to make it to trial, and he sought $20,000 in damages from Radam in a Brooklyn court. Radam's newly-acquired wealth allowed him to retain the agnostic philosopher Robert Ingersoll as his attorney for the Brooklyn trial and the man who would eventually manage the American interests of I.G. Farben as his chemical expert. Despite these safeguards, the trial went badly for Radam. Once on the witness stand, the gardener couldn't place calla lillies, poppies, or even potatoes in their proper botanical orders. (Radam insisted this was because he forgot these superfluous facts ever since discovery of the Microbe Killer.) Even the surprise admission of Radam's expert witness that Radam did indeed use hydrochloric and sulfuric acids to create his concoction – for which mankind should be grateful to Radam for discovering the process – could not prevent the Brooklyn jury from awarding Eccles $6,000. Radam appealed the verdict, fired Ingersoll, and pursued his own case against Eccles in a Manhattan courtroom. The gardener was kept off the witness stand by his new attorneys, who argued the case on a legal technicality by stating that Eccles failed to detail each point of his arguments against the Microbe Killer. The judge charged the jury to rule in favor of Radam, who walked out of the courtroom with a $500 award. 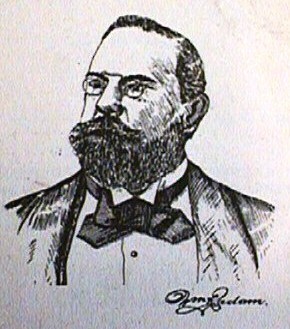 Despite the fact that Radam was $5,500 short overall at that point (the Brooklyn award was eventually reversed), he called the Manhattan verdict "a complete vindication of the unjust charges and libelous attack" on his Microbe Killer and proclaimed the victory in newspapers and pamphlets. He also warned Eccles during the trial that if Eccles made any further attacks on the Microbe Killer, he would be "challenged to mortal combat" by Radam. William Radam, gardener turned quack medicine peddler extraordinaire. Once again, Eccles continued his attacks undaunted, but the promised duel never materialized. Radam realized that Eccles' reports were printed in drug trade journals, which were read by almost nobody outside the profession – but Radam's advertisements ran in newspapers across America, which everybody read. His fortunes were therefore secure. In fact, it seemed that the only thing Radam could not do with his money was take it with him when he finally passed away in 1902. His body was returned to Texas and buried at Oakwood Cemetery in Austin. The Microbe Killer, on the other hand, continued to be produced and sold not only throughout America, but also around the world. A factory in London churned out Microbe Killer jugs for British customers, while Melbourne Glassworks manufactured Microbe Killer bottles from 1900 until around 1912 for sale to Australians. Even after American journalist Samuel Hopkins Adams exposed the Microbe Killer in his landmark exposé‚ The Great American Fraud and the Pure Food and Drugs Act (America's first major anti-quackery legislation) was signed into law in 1906, the Microbe Killer apparently still realized a handsome profit for Radam's successors. ...if its package or label shall bear or contain any statement, design, or device regarding the curative or therapeutic effect of such article or any of the ingredients or substances contained therein, which is false and fraudulent. The Sherley Amendment was passed by Congress with far less controversy and fanfare than the Pure Food and Drugs Act; President William Howard Taft signed it into law in 1912. The Bureau of Chemistry, the precursor of the FDA, began analyzing numerous patent medicines to see if their manufacturers could be hauled into court for violating the Sherley Amendment. Out of hundreds of nostrums investigated by the government, the Microbe Killer, which still touted its efficacy in treating disease, was the first to be targeted. In the latter half of 1913, Federal agents raided a freight car and seized a large amount of Microbe Killer cartons en route from New York to Minneapolis. The bottles and jugs seized had a retail value of $5,166; government investigators estimated that the cost of producing the shipment at only $25.82. Carl L. Alsberg, chief of the Bureau of Chemistry, prosecuted the case against the Microbe Killer in court, indicating that the only effect of the minute amount of sulfuric acid present in the concoction would be to irritate the stomach and upper intestine of many people. The Microbe Killer attorney then asked Alsberg if his only complaint was against the inflammation caused by the medicine as it passed through the alimentary tract. Alsberg: What we are complaining of is more than that. It is the fact that a man may be very sick and use this medicine until it is too late to use something else. Q: Then it is the time he loses? Alsberg: The time he loses may be sometimes the difference between life and death. Despite numerous testimonials provided by the defense, the Minneapolis jury found that the Microbe Killer had violated the Sherley Amendment and recommended the destruction of the entire confiscated shipment; the district attorney stated, "I favor using an ax." Thus, in December 1913, under the watchful eye of a US marshal and a food and drug inspector, all 539 boxes and 322 cartons of Microbe Killer seized by the government were hauled into a pit in St. Paul. The boxes and cartons were broken open and then set on fire, and the bottles and jugs of Microbe Killer were smashed. This event apparently marked the beginning of the end for Radam's company and his cure-all. Today, the Koppel Building, built with Radam's money, still stands down the street from the capitol building in Austin, Texas. It has reportedly served over the past century as a hotel, a feed store, and even a brothel. Despite renovations in 1984, the Koppel Building remains faithful to its original architecture and now serves as the home of TateAustin, a public relations firm. 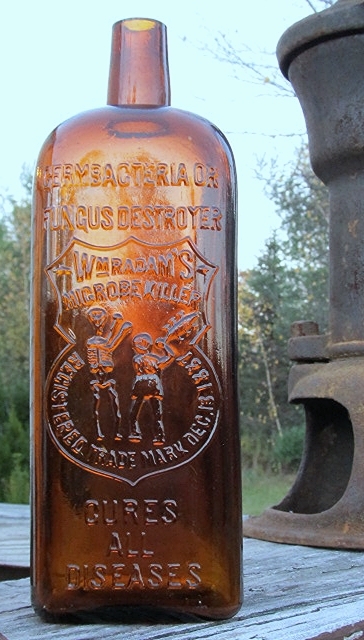 As for the Microbe Killer itself, some jugs and bottles of the elixir still survive to this day and have become prized collectors' items – especially if they feature Radam's distinctive trademark stamped on the front. Aside from these, however, there is little else to remind the average Texan that a Prussian-born gardener once made a fortune in Austin over a century ago by peddling a potion that allegedly cured all diseases by ridding the body of microbes. On the other hand, the discoveries made by Pasteur, Koch, and others regarding microbes served as the foundation for modern clinical understanding of microbes and disease, leading to an improved overall quality of life that Radam's Microbe Killer could never deliver. A correspondent asks for information concerning "Radam's Microbe Killer," as he has a patient with cancer whose family are strongly urging the use of this nostrum. "Sulphuric acid 0.59 per cent. "Sulphurous acid 0.016 per cent. "Inorganic matter (ash) '. 0.013 per cent. "Water by difference 00.381 per cent. diseases are causes by microbes in the blood. Microbe Killer will therefore cure them. WE EXCEPT NO DISEASES WHATEVER. For sale by E.C. FLEMING, Druggist, No. Impure sulphuric acid 4 drachms. Muriatic acid (impure) I drachm. Red wine about I ounce. Impure hydrochloric water i gallon. On December 23, 1912, the United States attorney for the District of Minnesota, acting upon a report by the Secretary of Agriculture, filed in the District Court of the United States for said district a libel, and thereafter an amended libel, for the seizure and condemnation of 539 wooden boxes and 322 pasteboard cartons of Wm. 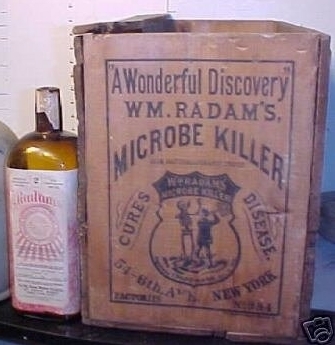 Radam’s Microbe Killer, remaining unsold in the original unbroken packages, and in possession of D. W. Ham, Minneapolis, Minn., alleging that the product had been shipped prior to October 29, 1912, and subsequent to August 23, 1912, by the Wm. Radam Microbe Killer Co., New York, N. Y., and transported from the State of New York into the State of Minnesota, and charging misbranding in violation of the Food and Drugs Act, as amended by the act of August 23, 1912. Nine of the wooden boxes were labeled: “ 1} Doz. Bottles No. 1. Drink Wm. Radam’s Microbe Killer It Cures 6: Prevents Disease. Oflice 121 Prince St. New York, N. Y. Guaranteed Food & Drugs Act—No. 793.” Three hundred and forty-one of the wooden boxes bore a label and brand similar to the brand set forth above except that the figure “2” was substituted where the figure “ 1 ” appeared on the foregoing label and brand; 21 of the wooden boxes bore a label and brand similar to that set forth above except that the figure “3” was substituted where the figure “1” appeared on the foregoing label. Thirty-eight of the wooden boxes were labeled: “Six Bottles No. 1. Wm. Radam’s Microbe Killer Blood Purifier—Digestive Antiseptic—Tonic. (Shield—Registered Trade Mark) Guaranteed Food and Drugs Act. No. 793. 121 Prince St., New York, N. Y.” Thirteen wooden boxes of the product bore a label and brand similar to the label and brand last set forth above except that the figure “ 2” was substituted whore the figure “ 1 ” appeared on the label and brand last set forth above; 23 wooden boxes of the product bore a label and brand similar to the label and brand last above set forth except that the figure “3” was substituted where the figure “1” appeared on the label and brand last above set forth. Twenty-two wooden boxes, each containing two stone jugs of the product, bore the following label and brand: “Jugs N o. 1 Drink The Water of Life (Shield-—Registered Trade Mark) Wm. Radam’s Microbe Killer. Guaranteed Food and Drugs Act No. 793. 121 Prince St., New York, N. Y.” Seven wooden boxes, each containing two stone jugs of the product, bore a label and brand similar to the label and brand last above set forth except that the figu.re “2” was substituted where the figure “1” appeared on the label and brand last above set forth; and 21 wooden boxes, each containing two stone jugs of the product, bore’ a label and brand similar to the label and brand last above set forth except that the figure “S” was substituted where the figure “1” appeared on the label and brand last set forth above. Twenty-three wooden boxes, each containing two stone jugs of the product, were branded: “Jugs No. 1. Wm. Radam’s Microbe Killer The Great Enemy of Disease You Drink It. Laboratory No. three New York, N. Y., U. S. A. Guaranteed Food & Drugs Act No. 793.” Twelve wooden boxes, each containing two stone jugs of the product, bore a. label and brand similar to that last above set forth except that the figure “2” was substituted where the figure “1” appeared on the label and brand last above set forth‘; 9 wooden boxes, each containing two glass jugs of the product, bore a label and brand similar to that last set forth above except that the figure “3 ” was substituted where the figure “1 ” appeared on the label and bland last set forth above. One hundred and forty-six pasteboard cartons, each containing six bottles of the product, bore the following label and brand: (On one side) “Six bottles No. 2 Wm. Radam’s Microbe Killer Digestive——Antiseptic Blood Purifier—Tonic. (Shield—Registered Trade Mark) Guaranteed Food and Drugs Act No. 793. 121 Prince St., New York, N. Y.” (On other side) “Living Microbes Cause Disease and death. Dead Microbes Create New Life and Growth. Wm. Radam’s Microbe Killer (Shield—Registered Trade Mark) Digestive—Antiseptic Blood Purifier—Tonic.” One hundred and seventy-six pasteboard cartons, each containing two glass jars of the product, bore a label and brand similar to that last above set forth except that the words and figure “Glass Jar No. 2” were substituted where the words and figures “Six Bottles No. 2” appeared on the brand lastset forth above. 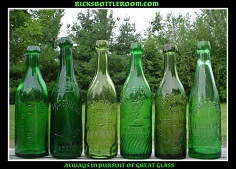 All the bottles, stone jugs, and glass jugs of the product bore the following label and brand: “Wm. Radam’s Microbe Killer (No. 1, 2 or 3) (Registered Trade Mark—Shield with pictorial device of skeleton and man with raised club) Guaranteed by The Wm. Radam Microbe Killer Co. under the Food and Drugs Act, June 30, 1906. Serial No. 793. The genuineness of every bottle is secured by Trade Mark as above and my name must be written on each label. Wm. Radam.” The label on the retail packages in each case or carton bearing the figure “1,” “2,” or “3” after the letters “No.,” according to and corresponding with the number set forth on the label of the case or carton containing such retail package. Accompanying said shipment were printed circulars, descriptive of said product. And upon the sides of each and all retail packages the labels read, “Being harmless it can be used Without fear as directed. Microbe Killer can be added to drinking waters as a safeguard against disease * * * It is unequaled as a digestive and for throat and stomach troubles * * * ” and on a pasteboard cover inclosing each and every bottle of said product appeared the following statements: “Digestive—Antiseptic— Blood Purifier—Tonic * * * Harmless as water—-* * * Added to milk makes food for the blood * * * For Consumption, Cancer, Catarrh, Rheumatism, Dyes pepsia, Kidney, Stomach, Liver, Throat, Blood, etc. * * * Radam’s Microbe Killer kills microbes and protects the blood from their attacks, thereby prolonging life,” all of which said statements, so appearing on the various labels as above set forth, regarding the curative and therapeutic effect of said product, “Wm. Radam ’s Microbe Killer,” were false and fraudulent in this: That said product would not destroy microbes in the human system, was not harmless, was not a tonic, antiseptic, or digestive, was not “food for the blood,” and was not effective for the treatment of consumption, cancer, catarrh, yellow fever, leprosy, diphtheria, or smallpox, and the designation of said product as “Microbe Killer,” as appeared on each and every package of said product, was false and fraudulent, in that by said name said product falsely and fraudulently purported to have the power of destroying and killing microbes within the body, when such was not the case; and said statements were so falsely and fraudulently made, and said name, “Microbe Killer,” so falsely and fraudulently applied to said product, with the intention to create the impression that said product was eflicacious for the treatment of the diseases specified and the killing and destroying of microbes within the body. On July 15, 1915, the United States attorney for the Northern District of California, acting upon a report by the Secretary of Agriculture, filed in the District Court of the United States for said district a libel for the seizure and condemnation of 8 cases, each containing 6 bottles, of “ Wm. 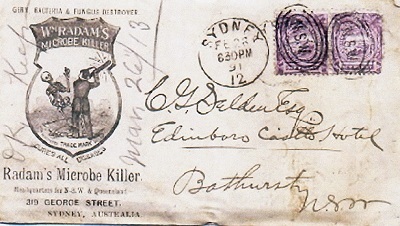 Radams Microbe Killer,” remaining unsold in the original unbroken packages at San Francisco, Cal., alleging that the article had been delivered for shipment, on or about July 12, 1915, by Wm. Radams Chemical Co., Berkeley, Cal.. and was in course of transportation from the State of California into the Territory of Hawaii, and charging mis-branding in violation of the Food and Drugs Act, as amended. It was alleged in substance in the libel that the article was mis-branded for the reason that statements on its label falsely and fraudulently represented it as the great digestive blood purifier and tonic; and as a sane, safe. sure remedy for blood and chronic diseases; and, when drunk in glassful doses, as a destroyer of the microbes without injury to the system, thereby preventing and eradicating disease, whereas, in truth and in fact, it was not. On August 11, 1915, no claimant having appeared for the property, judgment of condemnation and forfeiture was entered, and it was ordered by the court that the product should be destroyed by the United States marshal. "William Radam has recently published a book entitled Microbes and the MicrobeKiller. The book reviews the germ theory of disease exhaustively, detailing the long series of experiments made by Mr. Radam and others. It shows the value of the new remedies in destroying the microbes of disease, and clears away some of the mysteries with which medicine has so long been enshrouded. The style is simplicity itself and the book is therefore invaluable in the home and family, as well as of interest to the general reader." The Analyst then takes the New York Tribune to task for inserting the foregoing paid advertisement in its editorial columns, without mark or sign that would indicate to the reader the true character of the paragraph. The Tribune, it says, entirely forgetful of its dignity as a journal, of its character for truthfulness and reliability, and of the theories of its former editor, Charles A. Dana, which the New York Herald deems of such great value as to adopt them as its motto at the head of its editorial page every day, allows itself to be bought for a trifling sum to endorse an article that has been exposed time and again, and which every sensible person can instantly recognize as one of the vilest nostrums. In fact the Tribune does worse than this, for it not only endorses a vile nostrum, but by recommending a socalled book "on Microbes and the MicrobeKiller," admits that some one in the editorial rooms of that paper has read this nonsensical compendium of an ignorant charlatan's cries to a gullible crowd. It needs but a cursory glance at any page of this " book" to prove to any well-balanced mind that the man who wrote it is as ignorant of medicine and pharmacy as indeed he himself admits. Then why does the Tribune so far forget its duty to its readers as to publish such an endorsement? In order to satisfy any one who may not at the time have seen our exposure of Radam and his nostrum that we are not too severe, we will quote the following paragraph, which has been recently going the rounds of the press: "Radam's Microbe Killer is recommended to kill and rid from the human system all disease-producing germs." According to Dr. R. G. Eccle's analysis, given in the Druggists' Circular, it is composed of "oil of vitriol, impure, 4 drams; muriatic acid, impure, 1 dram; red wine, about 1 ounce; well or spring water, 1 gallon. This concoction is sold for three dollars per gallon, less than five cents being required in its manufacture." Such a combination of ingredients may kill the microbes, but what about the effect on the person taking the terrible dose? This is a suit by William Radam, the appellant, against J. J. Tobin and others, partners doing business under the firm name of the Capital Microbe Destroyer Company. 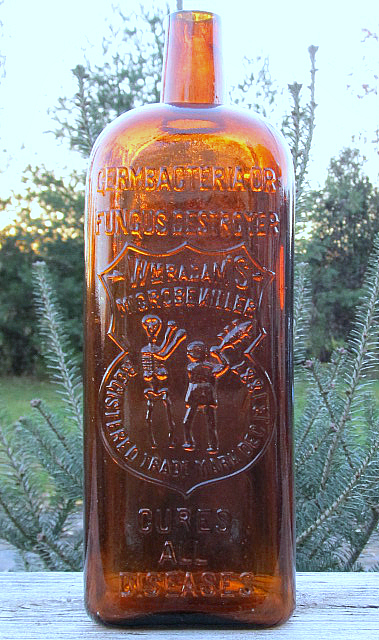 Plaintiff alleged that he had discovered a valuable medicine possessing great curative properties, was manufacturing and selling it at large profits, and had given it the name of " Microbe Killer," and as such, with the trade-mark, labels, devices, and symbols adopted by plaintiff, it had become widely known; that defendants, with intent to defraud plaintiff and to deceive the public, have prepared for sale a medicine inferior to plaintiff's, similar in appearance, and put up in similar packages, with label, devices, and trade-mark in imitation of plaintiff's, which are calculated to deceive and do deceive the public into the belief that the same is the medicine of plaintiff; that defendants are selling their medicine by such counterfeiting, to plaintiff's damage twenty-nine thousand dollars. Prayer for temporary injunction, to be perpetuated on final hearing, and for judgment for alleged damages. The answer of defendants denied all the allegations of the petition, and set up that Tobin had prepared a medicine for sale which he called the " Microbe Destroyer," a superior and different medicine to that of plaintiff, was selling the same under the firm name of the "Microbe Destroyer Company," but that plaintiff had no right to the exclusive use of the words " microbe killer"; that defendants' trade-mark is not in imitation of plaintiff's, and that there was no infringement a* alleged. The case was regularly called for trial on the seventh day of May, 1888, the day set for trial, when plaintiff's demurrers were presented to the court. ... This motion was filed on the 8th of May, and on the same day another motion was filed to strikeout that part of the amended answer, denying the alleged partnership, and declaring that Tobin alone was the proprietor of the medicine and trade-mark set up by defendants, and that he alone constituted the Microbe Destroyer Company; and also to strike out that portion of Tobin's answer setting up that the two medical preparations of plaintiff and defendant were composed of different chemicals; that plaintiffs medicine was a well-known mixture, and had been used as a medicine long before plaintiff attempted to appropriate it; that he (defendant) used the words "microbe destroyer " to indicate the real character of his medicine, and not to imitate the name adopted by plaintiff; that he has used in the sale of his medicine jugs of all sizes and colors, because jugs are suited to the medicine and are cheaper than other vessels; that he has never represented to the public or any person that he was manufacturing or selling plaintiff's medicine, or a medicine in imitation of it, or authorized any other person to do so, but on the contrary, has always represented it Plaintiff's trade-mark and label is described in the first part of the opinion in the case of Alff & Co. v. Radam, 77 Tex. 530; 19 Am. St. Rep. 792.
and all diseases arising from impurities of the blood. Dose: Wineglassful three times a day, before eating, in a tumblerful of water. Was an Expert Florist and the Discoverer of a " Microbe Killer." 'William Radam, the discoverer of a " microbe killer," which bears his name, died suddenly of heart trouble yesterday at his home, 124 West Eightieth Street. He was born in Germany fifty-eight years ago, and came to this country when twenty-three years old. William Radam, one of James Harvey Young’s celebrated “Toadstool Millionaires,” is a character whom everyone writing about patent medicines loves to hate, and finds easy to belittle and deprecate. The salient facts are simple. 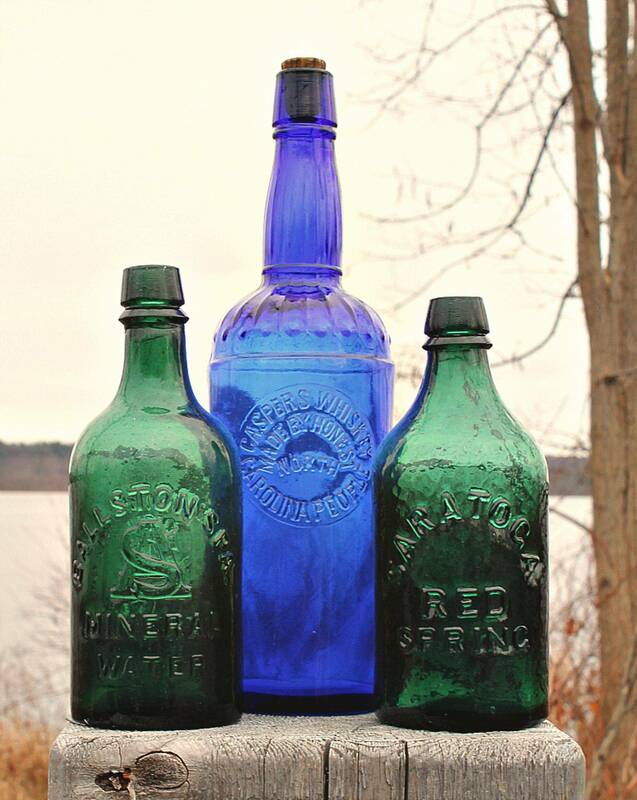 Radam manufactured one product, his Microbe Killer, which he patented in 1886 and marketed in vessels, often one gallon jugs, but later in smaller less expensive bottles as well, all decorated with an extremely eye-catching and flashy trademark. He claimed that microbes lay at the root of all disease, and that his Microbe Killer exterminated them all, and thus could defeat any and all disease. Its immediate, remarkable popularity propelled Radam from his nursery in Austin, TX to a mansion on Fifth Avenue in New York City in about two years’ time. His intellectual undoing was as just as quick and spectacular. Analytic chemistry, then in its infancy, was almost immediately interposed against Radam’s theory and his claims. Repeated chemical analyses easily demonstrated that his miracle elixir was virtually 99% water garnished with traces of potentially poisonous acids and flavored with a touch of wine! How, we now wonder, could anyone have acclaimed the Microbe Killer’s wondrous curative power even for a second? Born in Prussia in 1844 and a veteran of its army, Radam emigrated to America in 1871. In 1890, wishing to explain and build upon his sudden fortune and prominence, Radam self-published a book in which he recounted his history and the manner in which he had come to develop his singular theory about disease and its cure. The tale ran thus: by 1884, he had become a gardener who owned small nurseries in and around Austin, TX. He had lost his two children to childhood illness and was himself a long term sufferer of intermittent malarial fever complicated by rheumatism and sciatica. He had tried every cure known to medicine, every patent medicine and folk remedy and had found no relief. His doctors told him his condition was irreversible, incurable and would shortly resolve itself into deadly consumption. The news of his imminent death impelled Radam immediately to begin to research the causes of disease, and of consumption in particular. His study led him to review the theory of evolution, recently proposed by Charles Darwin, and the most recent kind of classification of plants and animals by common ancestor-developmental relationships which it had engendered, all of which he accepted as true. He further learned that the latest discoveries by the distinguished French scientist Louis Pasteur and the eminent German scientist Robert Koch had identified microscopic germs, recently denominated “microbes,” as the culprits causing disease. From his close perusal of the most recent publications, he ascertained that while science could accurately describe and classify these microbes, neither the scientists nor the doctors could proffer a satisfactory method for destroying them. In a wondrous leap of illogic, he then concluded that since microbes were the source of disease, the compound that would kill them would conquer disease. Pondering these scientific insights together with his dismal fate, Radam turned to the plants for which he, as a gardener, cared, wondering if they possessed weapons to ward off the deadly onslaught of microbes about to overtake him. He theorized if he could discover the secret the plants used to protect themselves from microbes while themselves remaining viable, that substance might sustain him. After much laborious experimentation, sketched only in the most abstract detail, he found the right substance to expunge microbes, tried it upon himself and found himself growing stronger. He kept dosing himself with his own medicine and within a year he felt himself completely cured. Describing himself as a “cautious and prudent” man, he then determined to see whether his substance would have the same effect on others, and began to seek out around him other chronically ill people whose cases lay beyond the help of established medicine. He provided his treatment free, collecting only testimonials in return, and finally became so involved in producing his Microbe Killer that he neglected his nursery, had to leave his cherished livelihood, and trust his own financial well-being, as well as his health, entirely to his formula. By 1886, he had patented his compound, and by the end of 1887 had registered with the government his vivid, compelling trademark image: a vigorous, healthy young man dressed in a suit about to club a skeleton representing death, whose scythe has already been dashed from his bony hands and lies broken at his bony feet. He began advertising his Microbe Killer for sale by making a public declaration of his cure in the Austin Statesman newspaper issue of August 30, 1887. Radam’s ad struck a nerve and galvanized the public. The Microbe Killer was an immediate hit. Within a year he built his first factory, which is today the Koppel Building in Austin, TX, and not long thereafter, he needed seventeen factories just within the United States to supply the demand. That hunger for Radam’s Microbe Killer extended beyond the shores of the United States. Soon Radam had sales agencies and factories stretching from London to Melbourne, Australia. The 1890 book laid bare in complex detail the reasoning underlying his microbe theory of disease, and was laced with plenty of the latest microscopic pictures of disease causing microbes. It was augmented by the story of his own personal struggles and further enriched with photos of the very plush surroundings he now occupied. The mansion formerly had been owned by J. C. Fisher, founder of the Fisher Piano Company. As a publicist for his product, Radam was no fool. He put forward his thesis, proclaimed that he would be excoriated by the established medical community, and, reckoning that a large segment of the public distrusted doctors, challenged that community to disprove his reasoning. Almost instantaneously, Dr. R G Eccles, a pharmacist and doctor at Long Island College Hospital entered the lists as a challenger to Radam. He stated that his own private chemical analysis (the first of many similar ones done by various professional and scientific groups) showed that Radam’s compound was water, mixed with the slightest trace of highly corrosive acids and wine. Eccles claimed that Radam was a “misguided crank” who was “out quacking the worst quacks of this or any other age” as well as realizing a 6000% profit on every jug he sold of his worthless concoction. Radam sued for libel on the grounds that there were no acids in his mixture and Eccles countersued in the amount of $20,000, also for libel, because Radam denounced him as a charlatan. Although defended by one of the great iconoclastic thinkers of the time, the agnostic Robert Ingersoll, Radam lost the first round to Eccles, whose libel action against him filed in Brooklyn came to trial first. Radam made a poor witness on his own behalf, being unable to make elementary plant classifications when challenged as a gardener, and his own expert witness admitted that there were, in fact, acids in the Microbe Killer. The jury awarded Eccles $6000 against Radam, who promptly fired Ingersoll, and later managed to have the verdict overturned on appeal. Meanwhile, Radam, who did not testify again, obtained a favorable ruling on his lawsuit against Eccles filed in Manhattan, when the judge directed that the jury enter a verdict in favor of Radam on the technical grounds that the legal defense presented by Eccles was too general and not specific enough to answer Radam’s charges. So instructed, the jury brought back an award for Radam in the amount of $500. Having won a small verdict on a technicality, Radam declared himself entirely vindicated, and redoubled his advertising, emphasizing the favorable ruling. While Eccles and Radam continued to spar and berate each other, and other professional organizations quickly joined Eccles in inveighing against him, Radam’s legal “victory” pointed the way toward his future strategy for dealing with scientific carping at his reasoning and methodology; he simply ignored it, figuring that the people to whom his “medicine” appealed thought as little of doctors as he did. Sales did not flag and Radam’s shrewd calculation was sustained. While the trade journals and professional magazines continued to flail away at Radam, the exorbitant profits rolled in for the rest of his life, which ended in 1902, perhaps too soon and too abruptly for one as fortified against disease as Radam. He was buried in his beloved Austin, TX. The Microbe Killer remained on sale, even if advertised a little less conspicuously and flamboyantly after Radam’s death. Ownership of the business and trademarks passed to Ida Haenel Radam, his widow and beneficiary, whose name appears on the trademark applications after 1902. She seems to have retreated to Austin and left the management of the company to others. 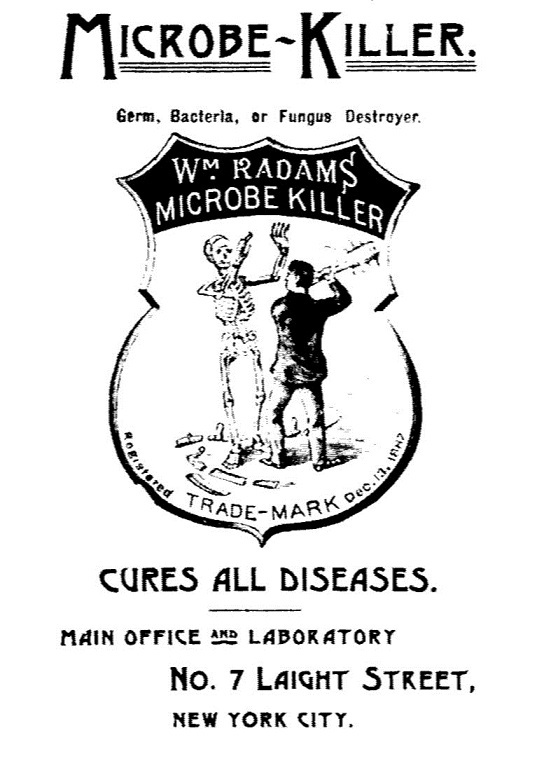 A 1904 trade publication advertisement noted that the Microbe Killer was now being made available through all jobbers instead of through Radam’s own restrictive and exclusive prior marketing arrangements. In 1905, one Walter W Bostwick (a sometime inventor who in 1897 was involved in an attempt to form a nationwide trust to control the patent leather industry) sued in the courts of New York for foreclosure against the company over the objection of the board of directors. Bostwick alleged he owned all of the bonds of the company; the directors claimed that the mortgage backed by the bonds had been rescinded. The court merely appointed a neutral trustee of the mortgage and left the parties to sort out the dispute. A 1912 New York Times article, reporting on the suicide of real estate broker Arthur S Levy, who, apparently despondent over ill health at age 58, administered one shot to himself from an “eight shot British bulldog revolver” in his Broadway brokerage office, identified Levy as the “President, Treasurer and Director of the William Radam Microbe Killer Co.” In 1915, Gordon S. P. Kleeberg of the New York City law firm of Myers & Goldsmith is listed as the President and Director of the company. Kleeberg (1883-1946) wrote a history of the Republican Party in 1911 and argued some significant tax cases before the Supreme Court, but seems to have had little direct connection to the patent medicine business beyond holding the company titles. The change in the public’s attitude toward the Microbe Killer came quite slowly. On November 28, 1905, Radam’s Microbe Killer was denounced as a completely fraudulent “medicine” in the lead paragraph of the third in the series of articles entitled “The Great American Fraud” written by a muckraking reporter named Samuel Hopkins Adams for the weekly general circulation publication, Collier’s Weekly Magazine. Because Radam was already dead, even Adams treated the revelation of the fraud underlying Radam’s Microbe Killer as old news, and devoted the bulk of his article to denouncing another very similar “medicine” which was then stealing some of the Microbe Killer’s thunder as the latest miracle cure. However, the hoopla created by the “Great American Fraud” finally raised public awareness high enough for people to demand protection against outright fraud. The result was the Pure Food and Drug Act of 1906, the first attempt to regulate the pharmaceutical and drug industry, which concentrated on removing adulterated and misbranded food and medicine from interstate commerce, and created the federal Food and Drug Administration. It was a first baby step, for the Act, as originally passed, required essentially only that the substance of the “medicine” match the substance identified on the label. However, only the most dangerous or poisonous substances, like alcohol or cocaine, actually had to be listed on the label. Since the Microbe Killer genuinely contained neither alcohol nor drugs, it easily slid past the narrowly defined constraints of the original Act, and proudly bore on its post-Act label, as did so many other equally implausible concoctions that remained on the market, “Guaranteed By The Wm Radam Microbe Killer Co under the Food And Drug Act of June 30, 1906." The medical and scientific communities were doubly outraged not only that the Act did nothing to remove the Microbe Killer from the marketplace, but also that the company and others could imply the government’s endorsement by stating that the Microbe Killer was “guaranteed” to be in compliance with the Act. 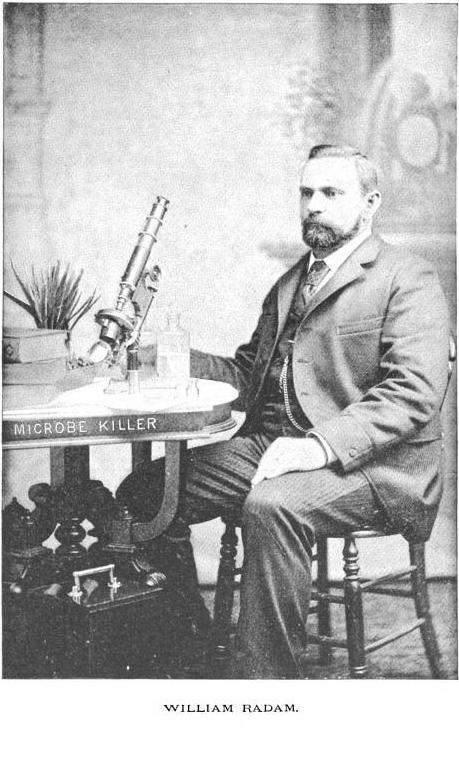 The American Medical Association denounced the Microbe Killer in 1910. The obvious solution was for the newly authorized Food and Drug Administration to take some further regulatory action, and so it did.. 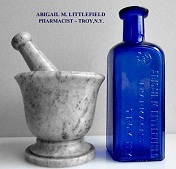 In 1912, the government persuaded Congressman Swagar Sherley of Kentucky to sponsor an amendment to the 1906 act that broadened the definition of a misbranded, and therefore illegal, substance, to include one where the label made claims concerning the “curative or therapeutic effect” of the medicine that were false or fraudulent. Congress passed the Sherley Amendment with much less fuss than the controversy that had surrounded the original Act, and William Howard Taft, now the president, signed it into law. With its power to regulate re-defined to include not just false claims about the ingredients of the medicine, but its efficacy as well, the FDA made the attack on the Microbe Killer one of its top priorities. A shipment of 539 boxes of bottles and 322 cartons of jugs was seized in transit between New York and Minneapolis, and the FDA brought its case against the Microbe Killer to Minneapolis in 1913. The FDA’s Chief Chemist himself testified that the Microbe Killer was actually 99.381% water and the only physiological effect of the trace of sulfuric acid contained in the balance would be to irritate the stomach lining. The Chief Chemist further opined that the contents of the shipment cost $25.82 to manufacture as against a retail value of $5,166. With Radam long dead, the Microbe Killer Co. lacked an effective spokesman to attest to the credulity of the many testimonials, stockpiled since Radam began collecting them in 1886, it introduced to offset the FDA’s Chief Chemist. The jury in Minnesota accepted the FDA’s testimony, and the entire shipment of Microbe Killer was condemned as illegally misbranded and destroyed in a public display of breaking and burning. While the destruction of that shipment of Microbe Killer in 1913 ought to have spelled the immediate end of the company, amazingly, it was still clinging to life as a business in 1922, when a New York Times article noted that its capital was being reduced from $260,000 to $25,000, a sure sign of corporate anemia. While the company disappears from the public records after that time, Ida Radam herself made one last brief news splash in 1929. At age 77, she journeyed from her home in Austin, TX back to New York City to re-arrange her investments. Ignoring the advice of her bankers, who said they would make the transfer from New York to Austin on her behalf, she insisted on personally carrying $63,000 worth of New York City bonds with her out of the bank. She then left them in a package on the back seat of the taxicab she took from the bank to Penn Station to return to Austin. The story does have a happy ending. The bonds were non-negotiable, and were returned to her again some eight months later, when an unidentified man turned the package in at Penn Station. Since the Crash of 1929 had occurred between these two events, it is difficult to calculate just how much relief Ida must have felt upon their return. Between 1887 and 1902, William Radam bucked scientific and medical opinion, as well as defying common sense, by invoking modern science with the true fervor of a zealot. Manipulating from a base of solid scientific research established by men such as Pasteur and Koch, he drew only the conclusions he desired, and let the earnestness of the pseudo-science he embroidered on top of the genuine knowledge answer his detractors. In an age of mistrust about matters both medicinal and scientific, his passion sustained the profitability of his Microbe Killer for not less than 30 years, as well as bestowing upon us that lingering and unforgettable trademark image of a healthy, well dressed young man clubbing the skeleton of death. SINCE my discovery has been given to the world the newspapers have published many articles concerning it. As a microbe scientist my opinions were often sought by newspaper reporters, especially when contagious diseases were prevalent. Undoubtedly the most thorough and complete article concerning the microbe-killer was published by the New York Daily Press on April 8th, 1894. One of that enterprising paper’s skilled reporters was detailed to make an exhaustive investigation of the microbe-killer, with instructions to spare no pains or expense in the completion of his task. The reporter conversed with many people who had taken the microbekiller, and then he passed a week in my laboratory examining microbes under powerful microscopes and experimenting upon them with the microbe-killer. Not until long afterward did I learn that during his week in my laboratory, notwithstanding the fact that he was in perfect health, the reporter had actually drunk a gallon of the microbe-killer in order to ascertain for his newspaper whether the gas-impregnated water produced injurious effects. A singularity of many great inventions and discoveries is that they were brought about by men who were least suspected of being able to solve the problems involved. Where a thorough understanding of mechanics was necessary, often the man unfamiliar with mechanical principles stepped in and did what others could not. Where a carefully grounded knowledge of science was deemed indispensable, the man who knew nothing about science became the enlightener of the scientific world. Instead of the professor it has generally been the student under him who has originated new combinations and applied new principles. The inventor of the steamboat was neither a sailor nor a mechanic. A priest discovered smokeless gunpowder. An apprentice first made dynamite. Edison had as competitors men who knew a thousand times more about electricity than he did, and yet he accomplished scores of things they could not. York City said recently that during the forty years he had been in business 275 inventions had been made in his factories. Of that number only six had been made by men who were thoroughly acquainted with the business. The others were brought about by young men working upon small salaries and by apprentices. The man with the thorough knowledge of the work had gone on doing it as his teachers had done. The apprentice, the young man who knew nothing compared with others, searched for an easier and better way, and thus reached success. Until then he was called a “greenhorn.” From that moment, in the estimation of others and in history, he became a master. There have been fewer strides taken in the field of medicine, probably, than in any other branch of science. The man who dared to disclose a new theory was cowed into silence by other physicians. Years ago, when Harvey dared to announce that the blood circulated through the whole body, he was set upon by a mob. Like Galileo, he remained firm. “ It does circulate, for all that,” was what he said to those who cursed him. Why did the physicians of Harvey’s time denounce him for proving that the blood circulated through the whole body ? Simply because that discovery showed that they were ignoramuses and had never known how to care for life. If Harvey had discovered a new use for pilocarpine, or a new anaesthetic, or even an antidote for some poison, instead of being persecuted he would have been congratulated by the medical profession of his day. They could stand a slight advancement, but to have it proven to them that they had, through gross ignorance, treated their patients in such a manner that life was impossible, was too much. What Harvey did in his time has since been outdone by another man. He dared go further than physicians and medical scientists dreamed of going. Alone he dared advance a new theory, a new system, and fight the abuse and oppression which met him from those who ought to have been the ones to welcome it most. Seven years ago he began the warfare with ideas and principles which electrified the whole world. He could not then argue like his opponents, but he accomplished results which proved what arguments could never prove. For seven years these results have been accumulating, until to-day there are one million people who believe in him, trust in him, and bless him for his discovery. This man is William Radam, the inventor and discoverer of Radam’s Microbe-Killer. It is easy enough to laugh at a new discovery. At first men laughed at the telegraph, the cable, and the telephone, and called them pretty toys. They don’t laugh any more. ~ It is easy enough to laugh at a man who says he can cure all diseases with a single medicine, but what are you going to do when he proves his assertion? There is a pretty romance of facts concerning this wonderful discovery, unequalled in fiction. Twenty-five years ago William Radam, a young man, then twentyfive years old, landed in New York. He was a German and had been in the employ of Emperor William in the Imperial Gardens in Bellevue. There he had learned how to care for flowers and trees. He never expected to enter any other business, because among flowers and trees he was happy—they were his children. From New York Mr. Radam went South, and with his imperial recommendations secured a position as gardener at the St. Charles Hotel, New Orleans. Here he remained two years. During that time he contracted malarial fever and was compelled to give up his position. he purchased a tract of land and began the culture of flowers and trees. In a' business way he was successful. The trees he planted and cultivated were shipped to California, Arizona, Lower California, Mexico, and other Western States andTerritories, where they stand as monuments of his industry. The tract of land he originally bought was irrigated and became like a garden. By this time Mr. Radam was wealthy. He was one of the leading florists and nurserymen of the great West, and his name was known throughout the East, where he was recognized for his skill in buying seeds and plants for his nursery. But a shadow rested upon Mr. Radam. He could see his bank deposits increasing daily, but he could also feel his health leaving, his muscles weakening. To the original attack of malaria had been added rheumatism, then catarrh, and finally the dreaded consumption. For seventeen years he had employed physicians. Perhaps they slightly retarded his diseases, perhaps they accelerated them. At any rate, Mr. Radam found himself seven years ago on the threshold of death. With feeble steps he could still wander among the flowers he loved, but he knew that he could only live a short time. Yet in this condition he was on the verge of a great discovery. In his long career as a florist Mr. Radam’s great success had been brought about by his ability in preserving his plants from disease. When a plant or stalk began to look sickly he looked for some cause and always found it. His discoveries in this line were worth recording in science. There are many fungi or plant microbes in the greenhouse. Every gardener knows that. Some kinds are so numerous that they can be seen in little bunches upon the sides of plants or upon the ground around them. There is a sickness of the rose called the black rust, the symptoms of which are black spots on the leaves, and these spots grow larger and larger until the whole leaf turns black. This is the second stage. The third stage soon follows, in which the leaves turn yellow and finally drop off. This rust is contagious, and the spores or seeds from. the fungus infect all other roses in the vicinity, just the same as persons with the cholera or small pox infect others by proximity. The fungus of the cutting bench resembles in appearance a spider web, and, if left undisturbed, grows and covers about one square foot of surface in six days, and every cutting which stands within reach of it is affected and dies. Another thing Mr. Radam discovered about plants which was of use tohim afterward was that the plants were affected by changes of weather. In warm, damp weather his little seedlings were in more danger than on bright, sunny days. , After some changes of weather, especially after sunshine followed by rain, he noticed that on the leaves of plants, which were healthy-looking before, tiny little spots grew, and, when the wind blew, covered the whole surface with a kind of rusty-looking smoke. On other plants a difierent species could be seen, showing that different plants were affected by different diseases. Mr. Radam early decided that the fungi on plants were nothing more than microbes, and the reason for different plants being differently affected was that they were affected by different kinds of microbes. There was nothing new in this theory, although Mr. Radam discovered it himself and did not read it in text books on botany. He tried to save his plants by cutting off the fungi, but soon found out that this treatment had no permanent effect. The fungi grew out again, generally in the same place, but often in many other places. This led him to the additional discovery that the little fungi or microbes were actually in the sap of the plants, and that unless the sap was purified the condition would remain the same. He tried many ways of treating the roots of his affected plants. Occasionally he was successful, as some species of microbes yielded to his application of antiseptics to the roots. But his efforts, on the whole, were a failure, and he found that the safest way was to remove the infected plants, so as to save the healthy plants. It took Mr. Radam only another step to discover that, in reality, the various kinds of microbes had a similar effect upon p1ants—that is, they attacked the plant and caused fermentation. The rust on the rose leaves, he found, was nothing but. fermentation, the result of the action of microbes. The rotting away of the wood of plants was fermentation. He applied the theory to other things with equal success. Mr. Radam also noticed that plants inherit the seeds of the microbes. On many occasions he preserved the seeds of a yellow-looking arbor vitae that was sickly, and sowed them. The result was a growth of sickly-looking yellow plants, which either soon died or never amounted to anything. The blight of the pear tree he transferred by budding to healthy trees. In a short time those trees were affected by the blight. The bacteria which he transferred from a yellow-looking tree to a healthy one inoculated it so that it soon became yellow. These discoveries were of inestimable value to him afterward. Early in his career as a gardener Mr. Radam sought means to kill the microbes or bacteria which affected his plants. Thousands of experiments were made. He tried various alkalies and acids, tobacco smoke, and borax. None of them worked successfully. If he succeeded in arresting the progress of disease in his plants he had to apply something so strong that the plants died from the effects of the remedy. rest fermentation, it would signify that the microbes had all been killed. Upon these lines Mr. Radam pursued his investigations. To arrest fermentation he found antiseptics were necessary. He tried all the known antiseptics and they failed, for if they killed the microbes and thus arrested fermentation they also killed the plants. Tobacco smoke, he found, was of use only temporarily. ,He burned other substances in the greenhouse and watched the results. Some results benefited the plants, and others did not. One day Mr. Radam noticed that during certain of these experiments he felt in better health. In fact he found himself a sort of barometer to tell the condition of his afiected plants. If he felt in good spirits after an experiment with certain gases, he noticed that his plants looked better. He attributed this at first to his mental pre-occupation. One day, after settling with his physicians and being told that he had better put his business affairs in shape, so others could carry on his business in case of his death, Mr. Radam walked through his greenhouses and gazed sorrowfully at the plants he must soon leave forever. He came to some diseased plants and paused. Suddenly the thought struck him that what was true with plants might be true with man—that diseases in man were caused by microbes, as diseases were caused in plants. From that moment he was a changed man. He said to himself that if he could find some antiseptic that would destroy the microbes in his system he might get well. This was the way he reasoned : If there were microbes in his system which caused his diseases, then there must be fermentation. It took but a moment to convince him that what his lungs threw off was nothing but fermentation. Then, if he could but arrest this fermentation, it would signify that he had killed the microbes which caused the fermentation. carbolic acid weak enough to be taken with impunity, it would have no effect upon the microbes. If he could only get an antiseptic gas, he said to himself, which was powerful enough to kill the microbes and still not powerful enough to injure him, then he might yet recover. Up to this time Mr. Radam had never read a medical book, and he knew nothing about chemicals except those he had used in his greenhouse experiments. Seven years ago a few of the bolder physicians had declared that certain diseases were caused by microbes, but the public did not believe them, and as a matter of fact those physicians were not certain of their claims themselves. But Mr. Radam had never heard of their discoveries or pretended discoveries. He had worked the theory out himself, reasoning that if Nature had affected plants with microbes, why should she not also affect human beings with microbes ? To the drug stores Mr. Radam went and bought all the antiseptics he could. He was not a medical man, but he knew that it was unsafe to play foolishly with chemicals. In other words, he did not dare experiment upon himself. One day Mr. Radam felt convinced that if the medicine his doctors were prescribing for him did not stop fermentation outside of the human body, it was not possible for it to stop the fermentation inside. Consequently he placed some fermentation which his own lungs had thrown off in his doctor’s medicine and corked it up. In a few days the fermentation increased, which conclusively proved that the microbes not only lived but propagated in the medicine which was expected to cure his disease. From that day he has not used a drop of medicine outside of his microbe-killer. With the antiseptics he purchased Mr. Radam experimented upon raw meat. None of them came up to the requirements he exacted. If they preserved the meat they injured it. Substances which would not injure the meat were too weak to prevent decay. Then Mr. Radam began compounding these antiseptics with other drugs. His experiments were not successful. He continued, however, until he had experimented with all the drugs obtainable in the drug stores of his city. Still he was unsuccessful. It was then that Mr. Radam resorted to gases. None of the known gases produced the desired results. For days and nights Radam worked. His friends thought he was wasting his time, but, as they knew he had only a short time to live, they humored him. Like Ponce de Leon in his search for the spring of life, Mr. Radam was seeking something which would give him life. It was always before his eyes, but like the will-o’-the-wisp it eluded his grasp and mocked him. Day after day the desired something seemed within his reach. He closed his fingers upon it, but it was not there. With his bits of fresh meat and his gases he worked day after day, then went to bed only to dream he had found what he was looking for. One day Mr. Radam mixed a combination of gases, some obtained by chemical extraction and others obtained by burning certain drugs, and placed the result in a glass can with a piece of fresh meat. The next morning the meat looked fresher than did the results of his other experiments. This encouraged him and he left it several days. Soon the meat began to ferment, but Mr. Radam knew he was on the right track. If he could only make the gas stronger, then he would have accomplished the results desired, and the fresh meat would keep forever. Under pressure he passed a quantity of this gas through water. He found that the water absorbed eight hundred times its own volume of the gas. That is, one cubic inch of water would absorb eight hundred cubic inches of gas. This gave him just eight hundred times as powerful an agent with which to conduct his experiments. Into a bottle containing some of this impregnated gas Mr. Radam placed a piece of fresh meat. After leaving it there three weeks he took it out. Every cell in the meat was as perfect as when he had placed it in the impregnated gas. He ate the meat and felt no evil effects. Then he began taking internally some of the impregnated water. Within a few days he felt better. The lungs began throwing off large quantities of fermentation, the rheumatism was less severe, and in fact Mr. Radam felt better than he had in years. He continued taking the gas-water, as he called it, and within four months the discharges from his lungs had ceased and he had gained ten pounds in weight, to say nothing of the improvement in his general condition. To cut a long story short, within a year Mr. Radam had completely recovered his health and his weight had increased from one hundred and forty-four to two hundred and seven pounds. He was then partially bald. The thought came to him to apply the water-gas externally to his head. In a short time a slight fuzz began to cover his head, and within a year he had a moderately thick head of hair. Mr. Radam had noticed that different plants had been differently affected by the substances he had tried upon them. Therefore he was not certain whether the means that had cured him would cure any one else or not. He had no intention of giving up the florist business to engage in selling medicines, and he looked upon his discovery only as what had been the means of restoring him to health. In spite of this, however, there grew upon him the desire to know what effect the medicine would have upon others. If he had made no mistake in his theory, all diseases were caused by microbes, and in order to prevent fermentation, which is really disease itself caused by microbes, an antiseptic was needed powerful enough to destroy the microbes without injuring the person taking the medicine. He could prevent fermentation, as already shown by his experiments with the pieces of fresh meat. By the use of his gas-impregnated water he had arrested fermentation in his own body and cured himself, when he had been told by his physicians that he had only a short time at the most to live. Would his discovery work as successfully with other people as it had with him? Would it kill the microbes which probably caused other diseases as well as the microbes which caused his particular diseases? These questions bothered Mr. Radam. Day after day he longed to know how valuable and far-reaching was his new compound of concentrated gases. He determined to try the medicine, if possible, upon some person affected with disease. The laws of Texas were then, as they are now, very strict regarding the practice of medicine. If he gave the medicine to a sick person, and instead of recovering that person died, then he would be liable for murder. Again, if he prescribed the medicine for any one he would be attacked by the physicians, no matter whether it cured the patient or not. As he had absolutely nothing to gain except to satisfy his curiosity, Mr. Radam bided his time. A short distance from where he lived a young man was dying with consumption. A few months previous three members of the same family had died of consumption, and the death of the young man in question was supposed to be a matter of only a few weeks. Then Mr. Radam went out of the room. When he returned a few minutes later the young consumptive wasgone and so was the jug. cine. His appetite was better and there was less fermentation in the lungs. In a few months he was practically well, and is alive and in good health today. His appreciation of the medicine was so great that he came to Mr. Radam and told him of a woman relative of his who was suffering from cancer of the breast. Again Mr. Radam told him he dare not prescribe the medicine, but he was perfectly willing to make up another jug of the gas and place it where it could be stolen. This was done and in a short time the young woman also recovered. By this time the report had gone abroad that Mr. Radam had discovered a wonderful medicine which had performed wonderful cures. Sick people visited him by the dozens. Still Mr. Radam did not dare openly advocate the medicine. He talked candidly with the people who came to see him. All offers of compensation Mr. Radam refused, because, as he said, he was not in the medicine business, and through gratitude in recovering from his own diseases he could well afford to allow a good many jugs of his remedy to be given away. Almost as much to his own surprise as to the surprise of others, the medicine seemed to cure every disease upon which it was tried. It proved then, what Mr. Radam has since proven to the scientific world, that all diseases are caused by microbes, and that the microbes produce fermentation and decay. To cure the disease it was only necessary to kill the microbes, stop fermentation, and the object was accomplished. The experiments which Mr. Radam had made with antiseptic gases and substances before he was successful had occupied a whole year. The results of the use of the “ microbe-killer ” had been published in the Austin daily newspapers, and as soon as the remedy was placed upon the market it had a large sale. With the little nursery as a centre the merits of Radam’s Microbe-Killer circulated day after day, performing apparent miracles in little hamlets, in mining camps, in villages and cities. Gradually it crept into the Eastern States, then to Canada and across the ocean. Mr. Radam was unable to manufacture the microbe-killer in quantities to meet the demand, and William Radam Microbe-Killer Companies were organized in different parts of the country. In nearly every State there was such a company manufacturing its own microbe-killer according to the formulas furnished by Mr. Radam. Gradually these companies have been consolidated, until to-day, in place of the great number of smaller companies, there is a large company in New York, a company in Chicago controlling the great mid-Western section, a company in San Francisco, a company in London, Canada; another in Melbourne. Australia; one in London, England, and another in Paris to control the whole territory of France. Mr. Radam has advertised but little, nor have any of his companies, preferring to trust entirely to the cures effected by the microbe-killer. One million people have used the microbe-killer, and their testimonials by the thousands have poured into the offices of the various companies, showing that the cures efiected by the microbe-killer have rivalled even the cures eflected upon Mr. Radam himself a11d his neighbors who stole the medicine with his consent. Long ago Mr. Radam was persuaded to give up the active management of his nursery and greenhouse and devote his entire time to the microbe-killer. fession toward it and the theories advanced by Mr. Radam. At first they laughed at his discovery and joked about it. His theories, they said, were nonsense. Diseases were not caused by microbes, they declared, but were simply diseases. It is singular to note how slow the medical profession was to adopt the microbe theory. Among the more ignorant practitioners to-day, among that class of physicians who have only recently accepted Harvey’s theory of the circulation of the blood—physicians ,who are giving pills and nostrums the same as their fathers didthe microbe theory is still unbelieved. But among educated physicians there is not one who does not know that every disease is caused by a species of microbes, which vary with the character of the disease. More than any one else in the whole world has Mr. Radam brought about this change of opinion. By his discoveries with the microscope, about which more will be said later, he has actually proved that there is a separate and distinct microbe for every disease. From their attitude of laughter, as the success of Mr. Radam’s medicine and theories became more apparent, the medical profession turned to jealousy. Later certain quacks and impostors began imitating the microbe-killer. From his laboratory Mr. Radam was compelled to go to the courts. Up to the present time he has had many cases in court, in all of which he has been successful. Probably the most persistent attack was made upon the microbe-killer by a physician and chemist, who declared that the microbe-killer was a poisonous combination of acids, which had no effect but to injure the whole system. This attack was inaugurated in an open letter published in a trade-journal. It was followed up by similar attacks under the signature of “M.D.” and other means of concealment. The writer claimed that his chemical formula would make the microbe-killer. That it was discovered by a nurseryman who knew nothing of medicine or medical science. That it was downright humbuggery to speak of all diseases being caused by microbes, for the reason that any man can count the number due to such cause on his fingers and have digits to spare. He asks the question whether such ignorance was excusable when it endangered the public health. The defendant also submitted an analysis of the microbe-killer which he claimed to have made. In return Mr. Radam submitted his affidavits that he had never purchased or used an ounce of any kind of acid in the manufacture of his microbe-killer. Healso proved conclusively that the combination of gases which he had used in making his microbe-killer, and the manner in which they were generated and mixed, absolutely precluded a chemical analysis. From the hundreds of volunteer witnesses among the persons who had been cured by the use of the microbekiller, the court received the evidence of twenty, as many as it deemed necessary. These witnesses testified that they had been cured by the use of the microbe-killer. Some had taken only a few gallons, while others had taken one hundred or more gallons of the gas. The long case at last came to a close. Judge Andrews, in his charge to the jury, told them that the plaintiff had been libelled and that the whole article was libellous on its face, and that the plaintiff had clearly proven, beyond all possibility of doubt, the microbe-killer was absolutely harmless and that it had effected wonderful cures. The jury immediately returned a verdict for Mr. Radam, and warfare was ended. But Mr. Radam went further. He actually cured of consumption a man who had been declared in writing, by the physician against whom the suit was brought, as having consumption. What more could be wanted to vindicate an inventor, a discoverer of new theories, than the result of the controversy? What seemed at first persecution proved to be a wonderful benefit. The success with which the microbe-killer met caused imitators to become active. In his safe Mr. Radam has dozens of circulars from quacks who were selling and manufacturing imitation microbe-killers. Some even went so far as to use Mr. Radam’s name and portrait as the name and portrait of the seller of the medicines alleged to be cures. 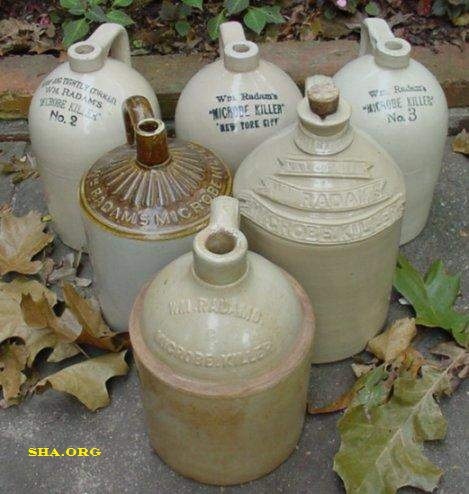 Some even used jugs identical with those used by Mr. Radam for the convenient keeping of his microbe-killer. Mr. Radam has won many suits against these impostors, and has many suits still pending which he cannot fail to win. Edison did for the electrical world, Mr. Radam did for the medical world, with this difference : Edison’s inventions were designed to benefit mankind, while Mr. Radam’s discoveries were to save the lives of sick people. Then Mr. Radam had no actual proof of his theories regarding microbes except his convictions and the cures brought about by his microbe-killer. To-day he is in a different position. During those seven years he has been a close student, not of medical books, but of NatureWith the most powerful microscopes obtainable he se cured microbes from nearly every disease known to medical science. He went further than this. In his own laboratory he constructed a wonderful instrument for photographing these microbes. It is too complicated to be described here, but the results it accomplishes will give an idea of what it will do. Upon a glass slide he can place a drop of blood. A few moments later he can show you a photograph five inches wide and seven inches long, showing the blood corpuscles looking nearly as large as silver dimes. But do not think that is the photograph of the whole drop of blood. The lens is so powerful that it only covers a hundredth part of the drop of blood. To photograph the whole drop of blood would produce one hundred similar pictures, or one continuous sheet of photographs containing one hundred. separate photographs, each seven inches long and five inches wide. Mr. Radam has made. He could secure no one competent to do the work, so he has done it all himself. In his laboratory he has many prints of microbes taken from every disease known to medical science. At the World’s Fair last summer he had hundreds of photographs of these different kinds of microbes, ranging from the microbes which eat into the lungs and cause tuberculosis to the microbes which eat into the scalp, cause dandruff, and destroy the hair. Such is the manner in which Mr. Radam has proven what he once held only as a possible theory. crobes. Under the powerful lenses upon the slides the microbes will live only about one hour. Then fresh microbes are placed upon the slides and the performances begin again. You can see the little demons, millions in a single drop, swimming about, jostling each other, breaking into sections, and each piece almost instantly becoming as large as the original microbe, cavorting and turning about, now in one direction, now in another. That is the way the microbes act when in the system. In an almost incredibly short time one microbe becomes a mass of microbes, then millions. Physicians from all over the country come to New York to see and study the microphotographs in Mr. Radam’s office. Not a day passes by that Mr. Radam does not have distinguished visitors—physicians, sanitary experts, business men, society women, and all classes of people—who want to learn more about microbes. Few men could have accomplished physically what Mr. Radam has in seven years. He is a tireless worker. Scarcely a day passes that he does not work sixteen hours, either in experimenting with microbes or writing about them. He has "written one large volume about microbes, which is regarded as a standard work, and he is now preparing a second volume upon the same subject, fully illustrated. Personally Mr. Radam is a very pleasant man to meet. He is tall, rather stout, with a full face, a high forehead, and an intelligent look flashes in his eyes. When he talks about microbes his face lightens up and he becomes a brilliant conversationalist. A reporter of The Press spent several hours with Mr. Radam one day last week, and was shown how microbes are photographed, and also shown the many experiments made before visitors at his offices, N o. 1288 Broadway. “ Although it took a long time to make the discovery, I did after all, and I can readily see now why it was more natural for me to make so great a discovery than for medical scientists. I simply did one thing. All my knowledge of plants and flowers I transferred to the human system. The analogy was perfect. Whatever causes fermentation in a plant will cause fermentation in a human body. Long before I made the discovery I had" found out that microbes caused fermentation in plants. As soon as I drew the analogy between plants and human life, I knew just as much about diseases in human beings as I knew about diseases in plants. “The great quantity of medicine I.took while under the doctors’ care I found afterward to be absolutely worthless. I was suffering from fermentation caused by microbes. Millions of microbes were swarming in my blood, propagating themselves into countless other millions, and all feeding upon my system. The medicine I took, instead of killing these microbes, actually helped to feed them. This I proved by a simple experiment after I had made my discovery. I had saved samples of all the medicines I had ever taken. Into quantities of these medicines I placed living microbes taken from my system. Instead of the medicine killing the microbes, as it ought to have done in order to cure my disease, the microbes actually propagated in the medicine. “When Professor Koch discovered his lymph the medical world said it was a great discovery, and was ready to accept his theories. I alone declared that it was founded upon a wrong basis. In all the New York papers I published exactly why it could not cure consumption or any other disease. People laughed at me,but I knew what I was talking about. The results of later experiments showed this to be true. “ ‘ Radam’s Microbe-Killer ’ is not a medicine any more than Seltzer water is a medicine. Just as the latter is charged with carbonic acid gas, so the former is water charged with antiseptic gases. It is used as water, only in smaller quantities. Its antiseptic power stops fermentation. No microbe, not even the microbes of leprosy, can live in it. But the doses must be sufficient to permeate the entire body. Doctors give a spoonful at a time. The dose of the microbe-killer is a wineglass or more. Physicians’ prescriptions are poisonous; this is not. Alcohol or whiskey is highly antiseptic, but when diluted with water it loses its antiseptic power. The same is true of drugs. Microbe-killer also loses its property when diluted, and then it becomes useless. It has no purgative eflects, and no drugs may be mixed with it ; but laxative pills, or any of the good antiseptic or purgative preparations in the drug stores, may be used for regulating the bowels. It should always be remembered that the value of any remedial agent depends on its antiseptic properties; a good supply of microbekiller, with means to regulate the system, is therefore all that is necessary to guard against and cure disease. 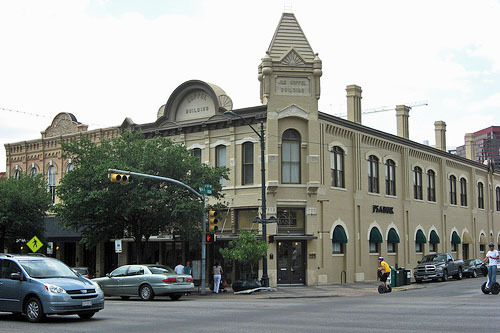 In 1888, while in Austin, Texas, Radam built the Koppel Building at 322 Congress Avenue, which still stands today. 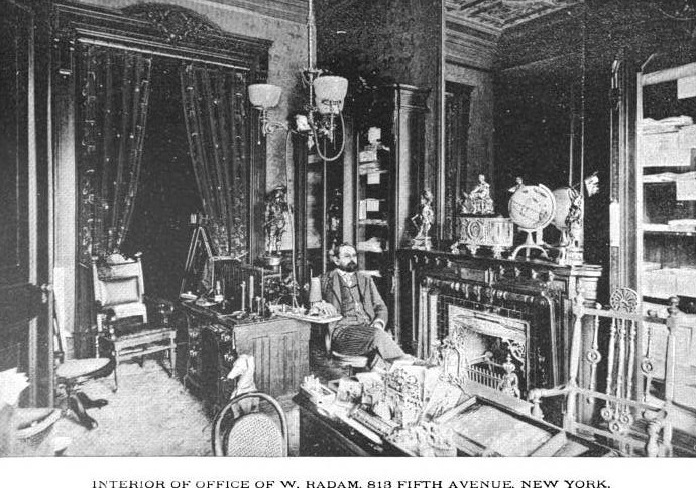 Radam became wealthy from the patent medicine business and moved to a luxury mansion overlooking New York's Central Park. He opened factories in London and Melbourne, Australia. Radam died a rich man in 1902, and is buried in Austin's Oakwood Cemetery. Radam's heirs continued to make money from sales of the Killer, but in 1912, an amendment to the Pure Food and Drugs Act, made deception in labeling illegal, and his potion was determined to be mostly water with a little red wine and dashes of hydrochloric and sulfuric acids. It was worthless as a medicine, and the lucrative business quickly came to an end.